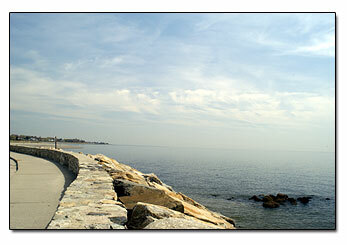 The Seawall Overlook is located south of the town of Stratford, CT in Lordship, which is sort of a suburb. 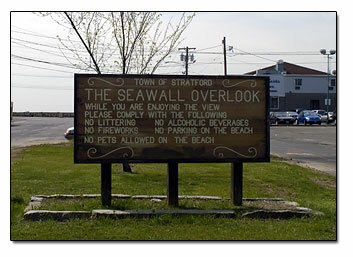 The Seawall Overlook is a very popular place for local residents. They park and drink their coffee and read the newspaper, or go inside Marnick's Restaurant for a meal. There are several popular restaurants nearby like Off the Wall, and a skating rink. The Clam Shack that was sitting on the corner, has been torn down and there is just an empty lot there now. The town of Stratford, CT is a really nice town and very historical. The settlers actually settled here first, before moving northward to establish Ripton Parish, which is now Shelton, CT.
Exit 32 off of I 95. Make a right at the light which is Main St. or Hwy.113. Follow Hwy.113 south past the Sikorsky airport, and make a right at the light. Follow this street (Hwy. 113) till it ends and go around the circle and make a right onto the Washington Pkwy. Follow this street and it will take you right to the Seawall Overlook.